The embedded Google Map below the coordinates of every attraction, beach, carpark, trailhead etc. mentioned in Exploring Ireland’s Wild Atlantic Way. While the files and map may be of some use to people who don’t own the book (yet!) it is primarily intended to be used alongside the book. The information is also available to download onto your phone and GPS. 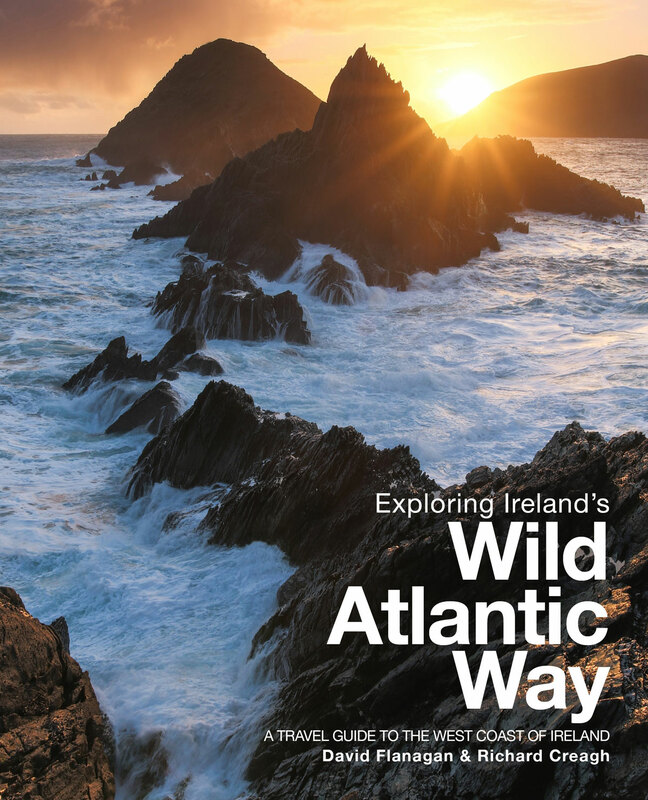 Exploring Ireland's Wild Atlantic Way is the only guidebook dedicated to the Wild Atlantic Way! Exploring Ireland’s Wild Atlantic Way is essential reading for anyone planning to visit the Atlantic coast of Ireland. Whether looking for ideas for weekend adventures or visiting from abroad you will find everything you need within this guide. This book’s focus is on the outdoors – on getting out into the fresh air, the wind, the sun and the rain – and experiencing the incredible natural beauty found everywhere along the coast. Buy it now for only €22.50 including postage worldwide. "This book is the rare guide book. It is informative and helpful, but it is also very beautiful. It is a must if you intend to explore the West Coast of Ireland." "The minute I saw this book I purchased it. Makes you want to get up from your desk and head West. Super photos, loads of detail." "I don't think a guidebook gets any better than this. Lovely photos (make you want to go to every place photographed) and lots of really good tips. " "The photographs are really fantastic. Ireland looks stunning! It makes you want to hit the road immediately & explore the Wild West. Buy it & do it." "If you ever needed encouragement to get out and explore what might be hiding on the west coast of Ireland, then this book has it!" "Lots of great tips for things to see and do along Ireland's beautiful Atlantic coastline, and great photos so you can see where you're going! " "The detailed practical information is what sets this book apart, as well as it's evocative imagery. The format is user friendly - whether in a car, or cycling or walking. " "Beautifully illustrated, just wonderful photos. Highly recommended." "This is a book for those who want to properly immerse themselves in the stunning outdoors of the west coast, those who want to end up windswept and salty, saddle-sore and blistered." "Received my copy of Exploring Ireland's Wild Atlantic Way & I haven't put it down since it arrived." "Fantastic book! Well written with lots of practical tips and advice. The photography is stunning & truly captures our beautiful Eire!"